Join us for a Week of #WaywardSisters! In a few short weeks the highly anticipated episode of Supernatural– Wayward Sisters– is set to air, and to say fans are excited is a bit of an understatement. The episode will be a back door pilot to a spin off to the long running show and it will be the tenth episode in the thirteenth season of Supernatural. In preparation for the episode – which is set to air on January 18th– we hope you will join us for a “Week of Wayward”! 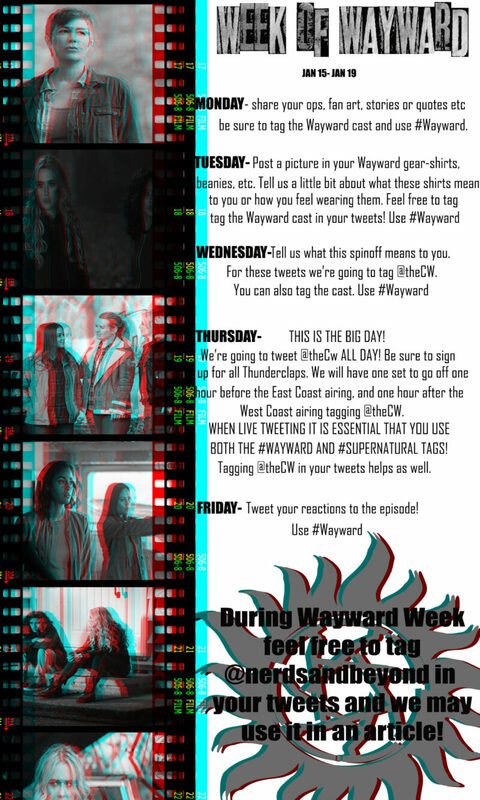 Starting Monday, January 15th and running all week we will be doing something each day to celebrate the Wayward movement. Join us on Twitter for a Week of Wayward starting January 15th. Be sure to save this and spread this information around! Monday- Post all your favorite ops and con memories/ experiences that you’ve had with the ladies. Haven’t been to a con? No problem! If you’ve got any Wayward fan art, or quotes you feel are Wayward AF we want to hear those, too! You can tag the cast but be sure to use #WaywardSisters. Wednesday- Tell us what the spin off means to you and/or why you want it to be picked up. For these tweets we will tag @thecw on Twitter. Use #WaywardSisters. Feel free to tag the cast of Wayward in your tweets if you’d like because this is also about supporting them/ showing them how excited we are as well. Thursday– TODAY IS THE BIG DAY! We want to make as much noise as we possibly can! We want to try and tell the CW just how excited we are all day long. We will have two Thunderclaps going off during the day on Twitter- one before the East Coast airing, and one after the West Coast airing. Live tweeting this episode is important, and be sure to use both #WaywardSisters and #Supernatural in your tweets. Friday– Tweet your reactions to the episode! Use #WaywardSisters, #Supernatural and tell @theCW how much you loved it! You can also go to the show’s IMDB page and rate the episode after it airs. What started as an idea, which then launched a social media movement will now be on our screens. This week is about making as much noise on social media and to the network that we possibly can, but we want to celebrate all aspects of Wayward, from the idea, to the t-shirts, to the things it has inspired and inspired in us. The idea for Wayward started with a tweet. That launched into a social media idea. That grew into a movement is over two years strong and a community of thousands. What started as fans saying ‘these characters having their own show would be kinda cool’ is now a reality of six strong, diverse female leads branching off from the longest running genre series in North American history, and though this is just the pilot, I can say without a doubt, we hope that Wayward will find a home. Here’s the links for the Thunderclaps! We are also launching a special Wayward video project! We are partnering with Wayward Daughters and Alana King on this! Learn more about that – here! Disney Releases “Zootopia” As Told by Emoji!